Ghostbusters is spooky, right? Yeah, I think it counts as spooky enough to go up for Halloween. 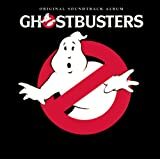 Here’s a cool little track from the Ghostbusters Soundtrack that I swear someone should sample and make into a hip hop tune or something, the best is wicked. It’s from the bit of the film where they’ve opened up the ghost storage and everything goes a little trippy. You know it’s all about the bit where the guy gets in the taxi and the driver is some sort of zombie. Ghostbusters rules! There’s another version of the tune, it seems. Be warned that Mick appears to have the cold, dead eyes of a killer in the video. Now that’s spooky!